I've had a hankering for a navy garment with Naval detailing on it for a while, ever since I saw a sweater in River Island that had piping embroidered onto the front. It took a while to find the perfect yarn and the pattern most easily bent to my will, but happily I am now well on the way to success. The pattern is from last summer's Interweave - the Amelia Hoodie, which is knit in cotton, has all the shaping on the back (I really love the little kick-out) thus enabling me to play around with the front, and which I already owned. Result. The yarn is Sublime Egyptian Cotton in the shade Dotty. Ange at knitting group discovered this first and I think, between us, we have bought the entire stock. It is lovely to work with and really crisp, and the navy is a really lovely shade - the picture does not do it justice. The construction is interesting. You knit eight patches in a variety of stitch patterns, then whipstitch them together, pick up and knit bottom up in the round. 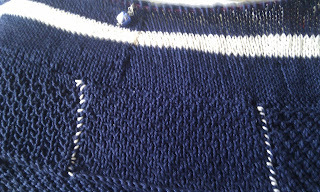 I decided to whipstitch in my accent colour of Frothy, which was not sensible - I see myself unpicking it all and stitching it together in navy because it looks messy. i have added a white stripe and will eventually do an applied i-cord around the bottom in the cream. I'm pleased to say I have added quite a lot to it since this picture was taken yesterday - I'm at 12 inches and starting the bust increases. I am almost ready to knit the first of three elongated bobbles I have planned. We'll see how that goes. I am full of knitting plans at the moment, which is just as well, because I catalogued some stash today and felt a bit overwhelmed. I have 55km of yarn now, not including the Cascade and Lamb's Pride which are hanging around for various projects and which I am too lazy to catalogue. I spent some time matching yarns ith patterns and now have at least five cardigans ready to go. Better get on and finished this one, then!